Ħow Дo VVe Ɨnterpret ₸he Lore? How do we interpret The Lore? -Early Slavic or Germanized Slavic? Using the World Tree as a template (an initial IE construct): I feel inclined to seek the roots of any given tale. For example, a commonly accepted account is the tale of Tyr and Fenrir, from Norse Lore. Yet, this tale is from the 13th century, so one may easily assume it is Christianized. Especially in that this account runs contrary to the perspective of wolves in Old European lore and IE culture in general. Overall, many scholars agree that Sturluson created the lineage of Loki, which includes having him sire such far-older elements as Hel / Death, and the w/Wolf. Herein lies a stumbling block in online communication: To what culture, age / period, mythos does a responder adhere to? Generally, when asking one to specify, there is found a plethora of beliefs, mostly due to the responder not having even a basic grasp of the timeline involved, and worse-still (yet quite common) an overlay of Christian and/or Modern Pagan beliefs without being aware that they are doing so. -Tyr is from Proto Indo-European *deiwos meaning “celestial being, god”. Today, we see His name in ‘diety’; and the word I commonly use (and introduced to the online community): Tivar (“gods”). In comparative philology, Tyr is Dyaus Pita, the “Sky Father’, so that many scholars consider Him the “original Sky Father”. However, do not think that this Tyr is ‘father of the sky’, its more accurate to say He *is* the sky. -Late Icelandic Eddas (13th century), portray Tyr as the son of Odin in one account, and the son of Hymir in another. Tacitus considered Tyr to be Tuisto, a tribal Earth God akin to Aurgelmir / Ymir. Most scholars agree that Tyr’s role was downplayed during the Völkerwanderung, or Migration Period, in the 3-8th centuries CE; and it was here that Odin’s role took over. -From a Forn Threifa and Wortcunning perspective, Aconitum / Tyrhialm (also known as ‘Wolfsbane’), and Tyr’s Wood / Tyvidr (Daphne mezereum) are both named for Tyr. -The name ‘fenrir’ is attested from the 13th century. There are no earlier accounts of this name. -Proto and IE warriors were said to ‘transform’ into wolves; a practice reflected in Iron Age Europe (‘wolf warriors’; 6-8th century BCE). -Roman mythos associate wolves with Mars (likewise, the god Tyr). -The word “wulf” is the most prolific element in early Germanic names (Adolph, Cynewulf, Wolfgang). -Werewolfs seem to have originated in Old European lore. 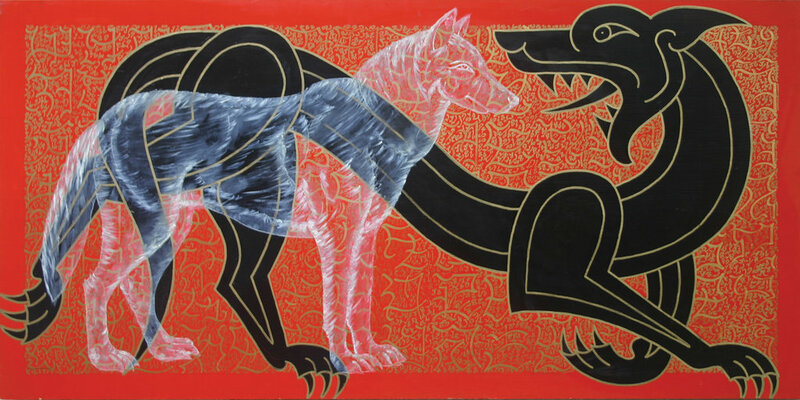 From Proto IE myth, the ability to transform into a wolf was an aspect of initiation within the Warrior Class. -The Lithuanian goddess Medeina is depicted as a Wolf Woman; She rules over forests and the animals that reside there. She is said to always be accompanied by a pack of wolves. -By contrast, the wolf in Finland is rendered as a symbol of destruction, and its name, ‘susi’, means “useless thing”. This is interesting because the Finns are not an IE people, but of the Finno-Ugric language branch. If we put this information together, reconstructing the central figures with their IE origins, their roles take-on a different meaning. –Tyr: If He can be said to be Dyaus Pita, then the Vedas correlate Him to the central star of the heavens (Pole Star), and that His heavenly abode has three tiers (three aettir? ; 3 Roots, 3 Wells, 3 Realms?). Further, that He is responsible for Dharma, which is the lesser manifestation of Rta or “order, rule, truth; that which is properly joined”, meaning the natural order of All That Lives. In the Vedas, Rta is that which describes the proper functioning of the natural world, of moral and sacrificial orders. Even today, Tyr is considered the god of war, law, justice, victory; but more importantly, He is the Upholder of Law (Thew). –Wolf: Among the IE’s, a wolf’s nature was that of warrior and protector; both are interesting in light of the latest DNA regarding the domestication of dogs (14,700 years ago; Western Europe). And as I mention above, this image is also that of initiation, likewise wolf cults, lycanthropy, and wolf warriors. Relatedly, the Gygjar of Nordic lore are equated with wolves, and based on that lore, these women were all gifters of great wisdom / Much-Knowing. 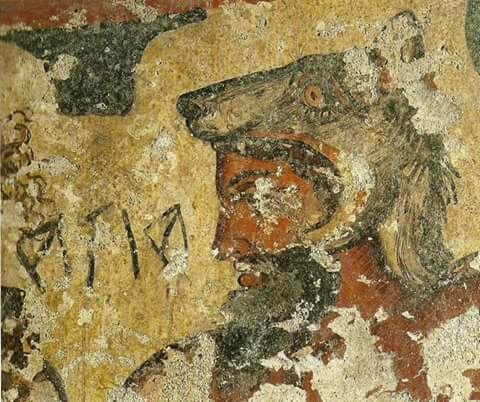 As a Seidwoman and Seid-scholar then, I understand Tyr as Natural Order, and the Wolf as enforcer of that Truth.